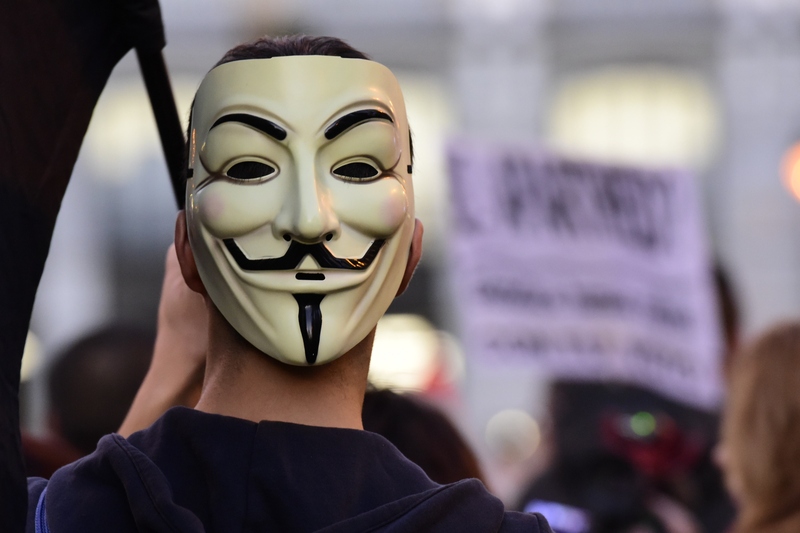 If you've had Internet in the last few years, then chances are you've seen the notorious Guy Fawkes mask being worn by an Anonymous member in a news story or on social media. The white face with rosy cheeks, manicured facial hair, and mischievous smile has become a powerful emblem for the hacktivist group. Seeing a sea of these identical masks, one can't help but feel both haunted and stirred. But the group didn't choose the image merely for aesthetic value. Why does Anonymous wear the Guy Fawkes mask? There's a lot of history and significance behind it. In short, the Guy Fawkes mask is a symbol of anarchism, political rebellion, and freedom for the people. Though the group does not have an official, specific philosophy, the Anonymous movement has reflected these core principles. Over the years, the group has championed such causes as Occupy Wall Street, which protested economy inequality, and Black Lives Matter, which demands racial justice and an end to police brutality. It's also targeted establishments it believes to be corrupt, such as The Church of Scientology and the KKK, and it's even gone after major terror organizations like ISIS. In order to galvanize the members of Anonymous (called "Anons") across the world, which is estimated to be in the millions, the group relies on one very powerful visual. But just what is the story behind the Guy Fawkes mask? You might recognize the mask from the 2005 political thriller V for Vendetta, which was based on the graphic novel of the same name by Alan Moore and David Lloyd. (Lloyd's design of the mask was carried over to the film, and is what Anons use). The story centers around V, a freedom fighter whose identity is never revealed, as he tries to start a revolution against the fascist government ruling a future, dystopian United Kingdom. But before the movie or book was the man himself. Guy Fawkes lived in 17th-century England, and went down in history as a revolutionary who tried but failed to blow up Parliament on Nov. 5, 1605. As a member of the Gunpowder Plot, Fawkes was responsible for guarding the gunpowder placed underneath the House of Lords. However, he was caught, arrested, tortured, and scheduled for execution, but he took his own life before his hanging. In the film V for Vendetta, V recites, "Remember, remember the fifth of November, the Gunpowder Treason and Plot. I know of no reason why the Gunpowder Treason should ever be forgot." The rhyme underscores the importance of the date, which has been made even more significant with Anonymous' annual Million Mask March, a mass international demonstration spanning nearly 700 cities that gathers thousands of people wearing Guy Fawkes masks in protest of government corruption, financial inequality, racial injustice, and anything else the group believes should be revolutionized. And thus, the story behind the Guy Fawkes mask has come full circle. Without the revolutionary spirit of Fawkes, we wouldn't have the impetus for the Million Mask March, an undertaking that would have made Fawkes — and V — proud.